I have an embarrassing phobia to admit: Like an estimated 51% of Americans, I hate touching things in bathrooms. I don’t like touching bathroom door handles and I absolutely hate touching foreign toilet handles. Even when things look totally clean, my inner germophobe is on high alert. Thankfully, plumbing fixture specialist Kohler has come up with new technology for those, like me, concerned about germs in the bathroom. Its new Kohler Touchless Toilet Kit allows you to retrofit your existing commode into a futuristic, high-tech, no-touch toilet. The Kohler Touchless Toilet Kit uses “extremely accurate” electromagnetic field technology, so all the ugly mechanical bits fit neatly inside your toilet tank. Just wave your hand over the top of the toilet near where the device is installed, and it’ll flush. Everything runs on 4 included AA batteries. The kit comes with a hole cover in case you want to get rid of the flush handle entirely. An optional hand icon decal is also included in case you want to clue the uninitiated in on how your new flush mechanism works. There is an important limitation to the technology, however: It only works on the common canister and flapper type toilets. It's not compatible with dual-flush, top-mount flush, pressure assist or ballcock valve toilets. 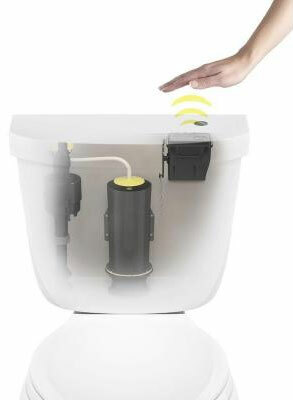 The new Kohler Touchless Flush Kit has an MSRP of $99.97, but is currently available at the Home Depot for just $75.00. And while you’re there, you may want to look into this: Kohler has a cool futuristic toilet seat nightlight available for retrofit, too. my cats would love this, it would be flushing all the time !